The defending champs got the road win in Cleveland and a 3-0 lead in the NBA finals over the Cavs and LeBron James. 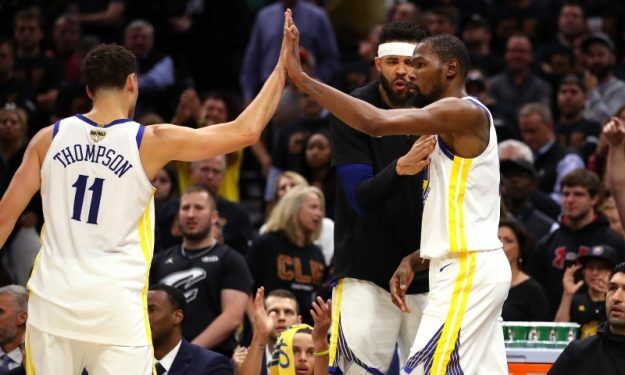 Kevin Durant scored 43 points, draining a big 3-pointer in the final minute almost identical to the one he made one year ago also in Game 3 of the Finals and the Golden State Warriors defeated the Cleveland Cavaliers 110-102. With one more win, the Warriors can get the sweep, their second straight title and third championship in four years. LeBron James scored 33 points and Kevin Love added 20 for the Cavs. The King had also 10 rebounds and 11 assists, but the Cavs have fallen into a hole in which no team has ever emerged. No team has ever overcome a 3-0 deficit in the NBA playoffs. Cleveland came back from a 3-1 deficit to stun the Warriors in the 2016 NBA Finals, but that was when Durant was still playing for Oklahoma City. Georgian big man Zaza Pachulia didn’t play for the Warriors and the same happened with Croatian Ante Zizic, Turk Cedi Osman and Spaniard Jose Calderon for the Cavs.